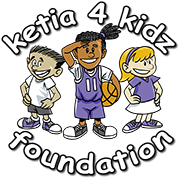 Ketia4Kidz Foundation was founded in 2008 by former WNBA Champion, Ketia Swanier to inspire military brats worldwide to pursue their dreams in life. Both of Ketia's parent served in the United States Army. Despite the challenges of being a military brat Ketia overcame those obstacles through hard work, dedication, and support from her family. These characteristics of a military brat helped her overcome her challenges. Her passion for sports helped her focus on education and athletics while growing up in a single parent home consistently because of deployments and military duties. This focus created hard work and determination that drove her to believe and pursue her dreams to become a professional basketball player. Ketia was inspired by her own story to inspire others like her. Finding a passion, becoming determined and having tremendous support helped her reach her goals.